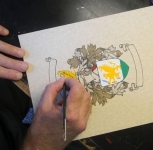 Your family name history and hand painted coat of arms together in two high quality hardwood frames with linen liners - all for under $100! 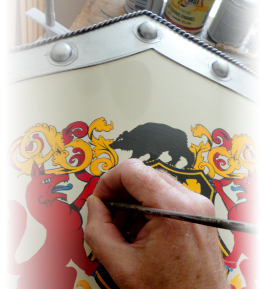 Unrivaled custom artwork features your coat of arms, hand painted in durable enamels, Indian inks, and gold leaf. 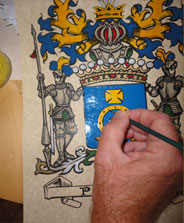 Matted in royal blue and framed in a premium 15.5"h x 13"w frame. 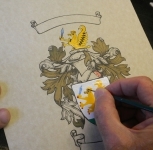 The family name history, with matching blue trim, is also framed in this hardwood frame and measures 16"h x 19"w. Positioned side by side, or with one over the other, this gift set is the finest commissioned heraldic art on the market today... and all for less than the photocopied alternative!